A little more than a year ago, Steve Jobs announced the iPhone at the MacWorld 07 Conference. If you're a follower of this blog, then you would know that I have been using the Apple iPhone for the past year. Although I was not completely happy with the first generation iPhone in my initial review, I wanted the new 3G iPhone to improve on the first generation and I've been anticipating today's keynote address by Steve Jobs. The new 3G iPhone was announced today at the WWDC (Worldwide Developer Conference) convention at the Moscone Center in San Francisco. This is a much anticipated and rumored announcement. For months, there are forums speculating the new iPhone of its features, design and cost of the phone. It's now only $199 for the 8GB and $299 for the 16GB version. It sports a 3G data connection. Basically, Apple finally addressed most of my gripes (and other iPhone owners as well) with the debut of this new iPhone. I'm happy to say, job well done. Watch the keynote below. This is the commercial for the new 3G iPhone. As you already know, this new iPhone has 3G data connection from AT&T which is not available to the iPhone until now. 3G was only available to the Blackjack, Treos, and Q. The old EDGE data connection was so slow that it wasn't feasible to use the iPhone for Web access unless you have a WiFi access near by. The new 3G iPhone has built-in GPS. It's not a big deal to me since I already have a portable GPS (Navigon 2100) and my Blackberry Curve has TeleNav. 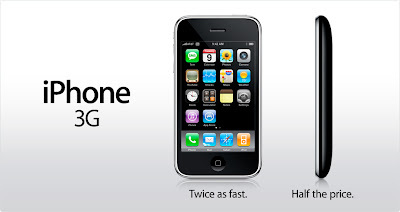 Nonetheless, it's one of the big selling point of the new iPhone 3G. Finally, you will be able to download Apps right from the iPhone such as games, and other utilities.